Grohe kitchen faucets feature European styles and functionality that compliment any kitchen. 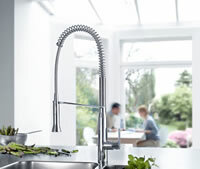 Grohe offers classic, transitional and modern looks intended to match practically any kitchen decor. Popular models like the LadyLux® series have decades of proven reliability in thousands of homes worldwide. Today, Grohe continues their legacy with a wide range of faucets for the everyday or professional chef at home. Grohe Pull-down and pull-out kitchen faucets are the perfect choice for either the contemporary or traditional style kitchen. Grohe kitchen faucets are available in decorative finish colors such as polished chrome and stainless steel. Grohe's pull out kitchen faucets come with a top or side lever handle, or even touch activated sensors on some models so you'll never have to touch the handle at all. Ladylux® combines contemporary design and maximum functionality with proven reliability for rigorous use. Nothing says sleek and modern like the Grohe Minta series. 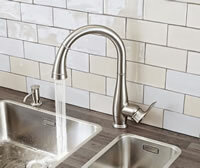 Grohe Minta kitchen faucets come with angled or gooseneck style spout. Browse and search the complete line of Grohe products for kitchen and bath. Genuine Grohe replacement parts for all faucets and models. Try our Grohe parts guide for fast identification.